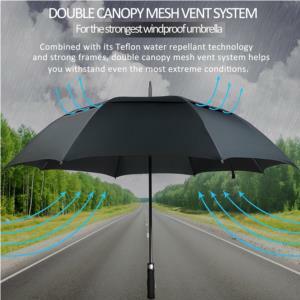 ·FAST AUTO OPEN – Nobody want to be fumbling with umbrella when caught in the Sudden Rains, especially during Heavy Rains. Fnova ST002 Umbrella features with a Auto Open Button on its ergonomic soft handle and will give you the quick rain or sun protection. It’s a must have for enjoying watching outdoor sports and events ! ·LIFETIME GUARANTEE - We cannot control the weather, but we strive to save you from wasted time, hassle , mess or stress. Every Fnova umbrella is backed by 60-Day Money Back Guarantee + 2-Year Warranty + Lifetime Repair or Replacement Guarantee! 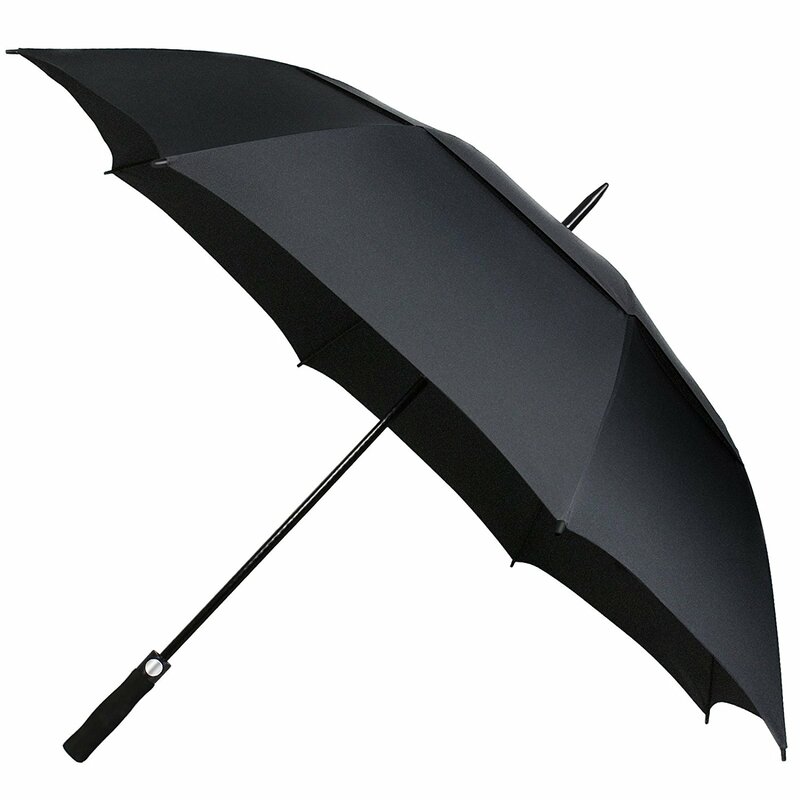 If, For Whatever Reason, You Don't Absolutely Satisfy with Your Fnova Umbrella, Just Return It, And We'll Refund Every Penny (Or Replace It, If There Is A Problem) . 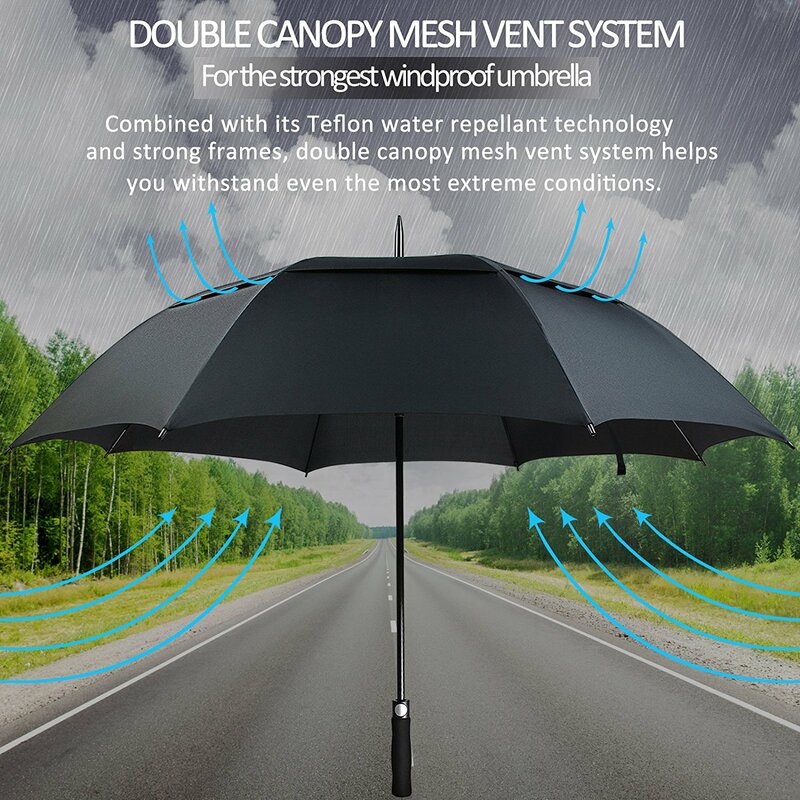 ·OPTIMAL AUTO OPEN Golf UMBRELLA – Fnova ST003 is a large, double canopy umbrella designed for the business professional, golf and life necessities. 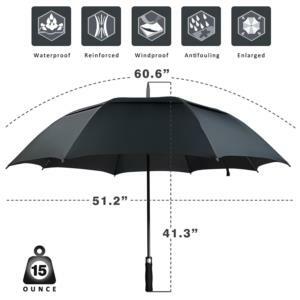 With its sleek looking, including Teflon Coated Waterproof Double Canopy, Ergonomic EVA Handle with comfortable grip for Americans hands and an Auto Open Mechanism, the Fnova ST003 is the perfect umbrella for modern lifestyle . 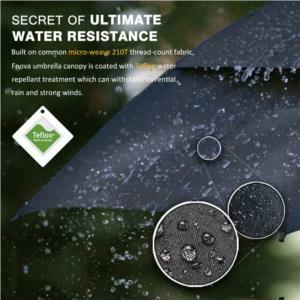 ·ULTIMATE WATER-REPELLENCY – Compare to other umbrellas polyester fabric, ST002 umbrella is made from 210T micro-weave fabric and coated with Dupont Teflon water repellent technology that repels water and dries fast. This advanced canopy plus its 60-inch large size will ensure you share umbrella with your companion and avoid wetting when you need it most . ·WINDPROOF DOUDLE CANOPY And FRAME SYSTEMS – Fnova unique frame system is engineered to be reliable and stand the test of time. Toughened Fiberglass Rod and Frames, Plus the Double Canopy can significantly reduce the chances of the umbrella inverting to key you and your belongings dry even during the toughest storms . Customer Review:Perfect size of umbrella that i really like! Customer Review:This umbrella has got you covered! 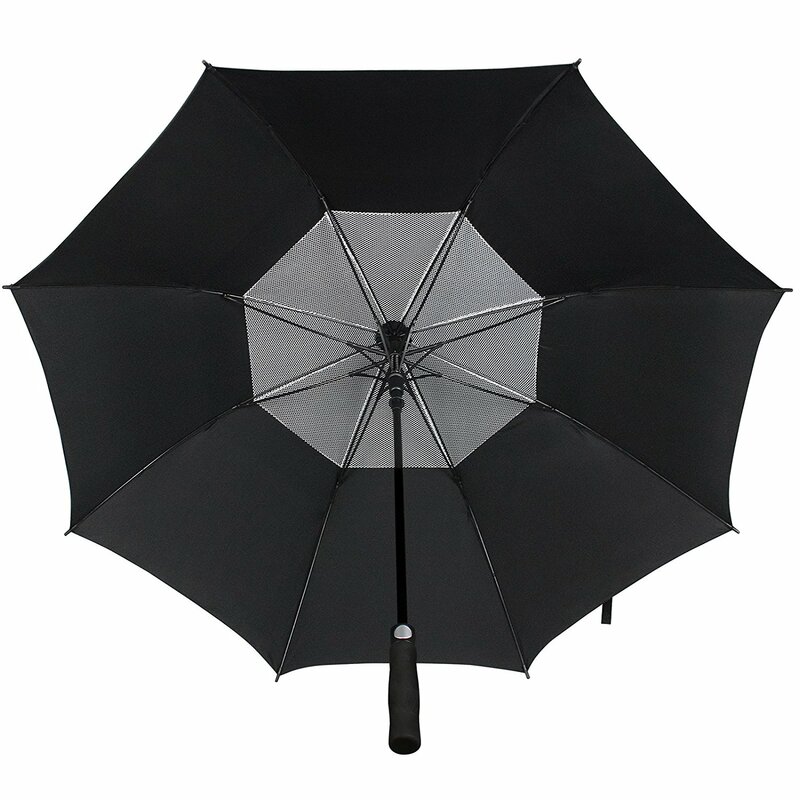 Customer Review:Fantastic double canopy umbrella that comfortably fits a family of three! Customer Review:It\'s ideal for the family! Can anyone tell me the diameter of the thickest part of the handle? Need this to fit in a clamp on a boat! Hi, the circumference of the thickest part of the handle is around 4.72 inches(4 3/4 inches), so diameter is around 1.5 inches(1 1/2 inches). what is the overall length when completely closed? Still 41.3" as the picture states or does it collapse or shorten when fully closed? It stays the same length, the outside diameter of the umbrella just closes toward the handle catch. Handle to the point does not change. 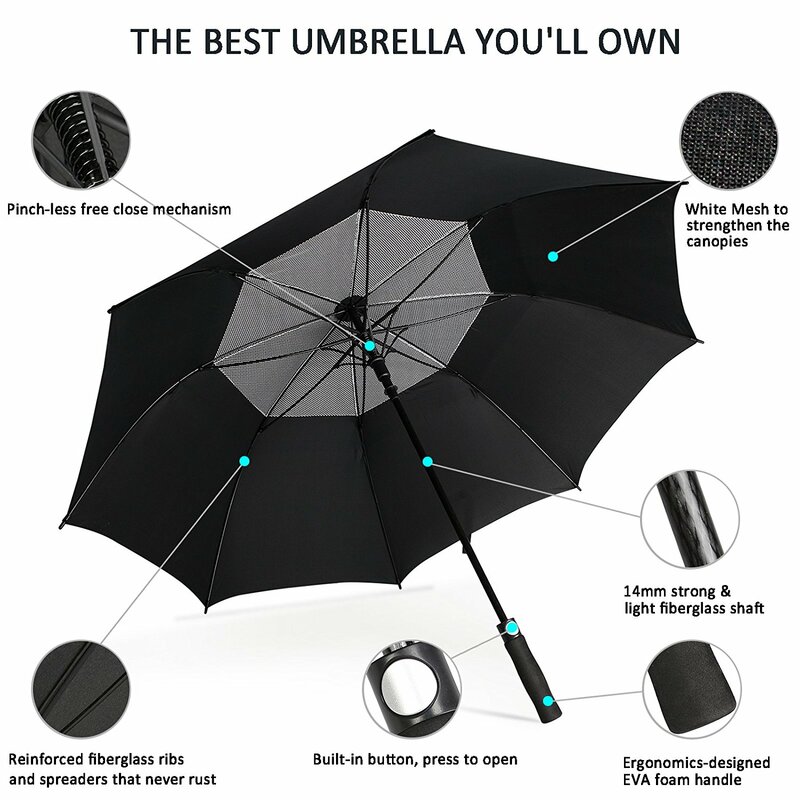 How long is the umbrella when closed and opened? This umbrella is not folded type. So length is the same while open or closed, it's 41.3 inches. On our listing page, the fifth picture shows the size. Then you'll find 2 types of compact umbrellas. what is the diamter of the canopy when opened? Mine measures exactly a 50 inch diameter. No one gave me afree umbrella ( hey,fnova, I'm availiable for free test trials). I have not had a chance to get rained on yet, but after a close examination I think this is a great umbrella. 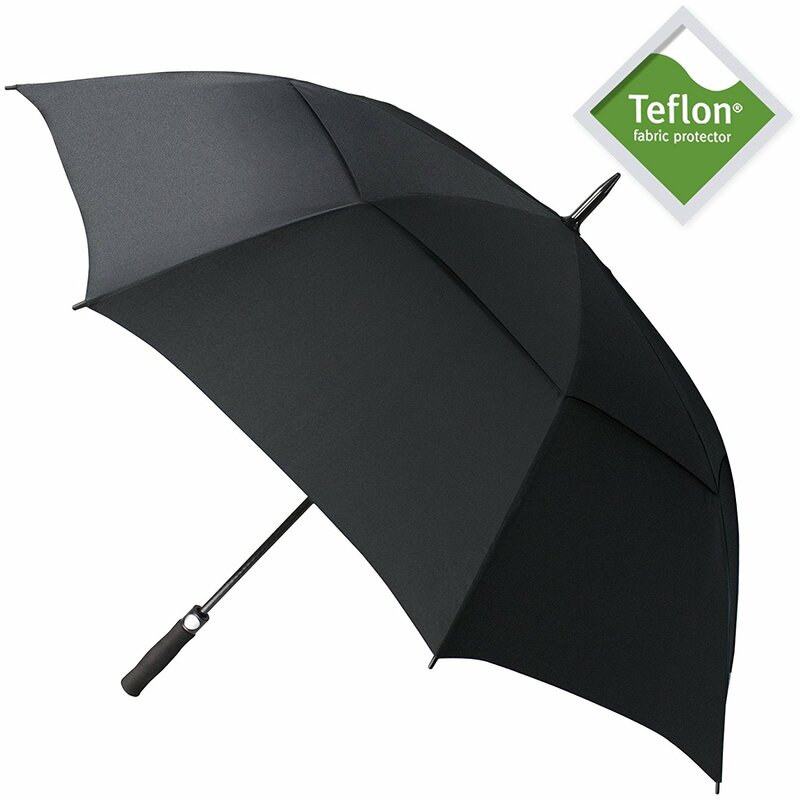 It works smoothly, looks sturdy and is comfortable to hold, better than any umbrella I have had in the past. I am impressed and happy. Thanks for a very good product! 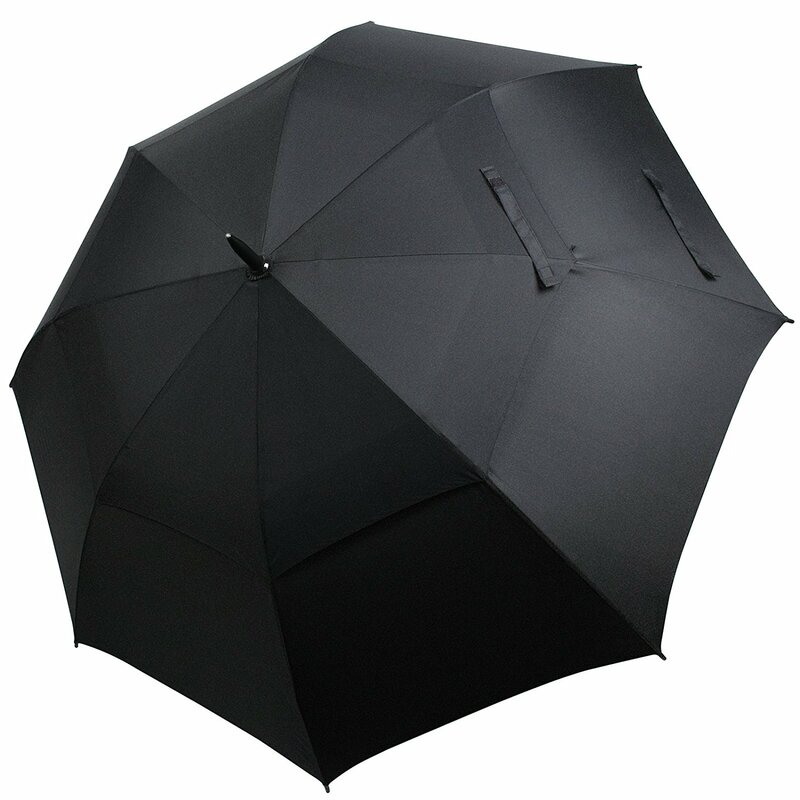 Fantastic double canopy umbrella that comfortably fits a family of three! After having too many portable, small umbrellas let us down, we decided to try out a full-sized model.Although it doesn't factor much into our review, we were impressed right away with how well packaged this particular umbrella was. It came in an oversized shipping box, which contained the actual umbrella's more form fitting cardboard box. Opening that box revealed the umbrella neatly tucked into a clear plastic protective sleeve (just for shipping, not permanent storage obviously). Inside that is the umbrella inside its own permanent protective, opaque black drawstring case. Classy.The foam handle is decidedly comfortable with a slight bulge in the middle to help with grip. The silver open button is oversized and easily accessible. The umbrella's "skeleton" is nice and thick and topped off with generous plastic caps. 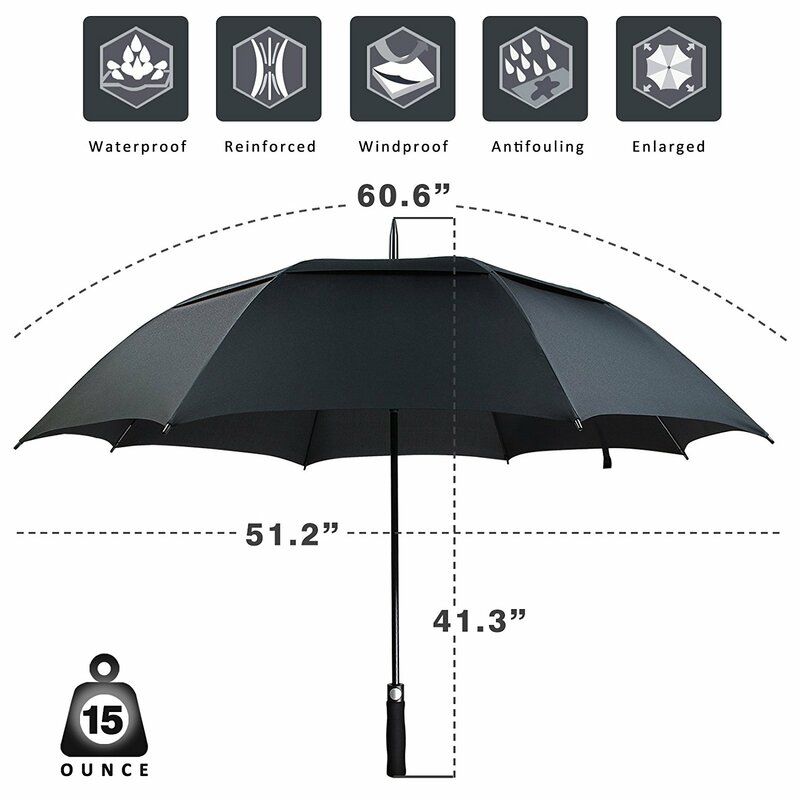 There's no exposed metal here like in cheaper umbrellas.Once you open this umbrella, you realize how large it really is. The size is incredible and would easily fit several adults under its double canopy. Apparently the canopy is made from 210T micro-weave fabric with a Dupont Teflon water repelling coating. Having used this in the rain, I can say for a fact that the water does indeed bead up and roll right off. Impressive stuff.If you're looking for a premium, oversized umbrella, I can't imagine doing any better than this Fnova model.Thanks to Fnova for the review unit. © 2019 Fnova. All Rights Reserved.